“The Ondekoza” is a 1981 documentary film directed by Tai KATO, who celebrates the 100th anniversary of his birth in 2016. His last work “The Ondekoza” focuses on the Japanese professional taiko drumming group called "Ondekoza". The story is about the co-founding young members of Ondekoza, who formed together in Sado in Niigata Prefecture, and created the Japanese traditional instrument taiko internationally famous. 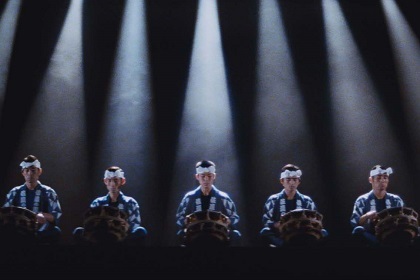 On completion of the film, Kato said “I finally accomplished what I really wanted to create.” True to his words, “The Ondekoza” is regarded as his masterpiece showing such feeling as Ondekoza flies through the woods of Sado playing taiko, taken through the use of the movie set and the technology of synchronous filming developed in Shochiku Ofuna Studio (1936-2000). However, for some various reasons, the film was never theatrically released.